Sydney Shop Girl: The Scent of White Gardenias. A Gift From the Farm. The Scent of White Gardenias. A Gift From the Farm. Dawn broke over The She Shed to reveal a sort of awake SSG slipping on her running shoes (not unusual) and the very first gardenia blossom on the plant I potted way back when the trying times were at their most trying. Those solitary moments when the day begins are great for taking some time out to ponder life, look forward to the future and to leave the past where it belongs. I got home this evening and found my single blossom still very much alive with that distinct gardenia scent that I hadn't noticed this morning in my zombie like, pre-run state. There was also a lovely surprise parcel in the post for me as well. Isn't that a gorgeous card? 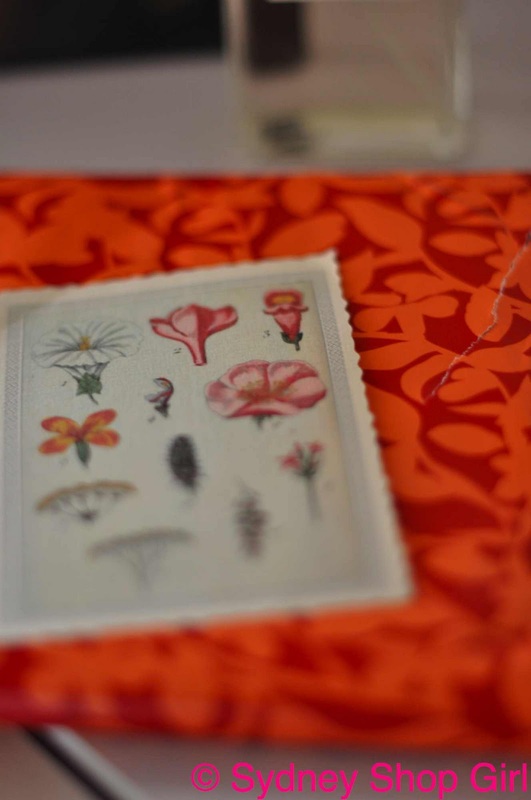 It's very apt for the floral theme of this post, I think. Good pick, AFW! But wait, there's more. Really, really fabulous more. 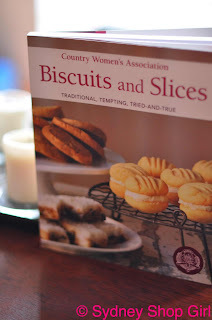 My first Country Women's Association cook book from a real life Woman of The Country. It's such a thoughtful gift. I've been meaning to dip into the wisdom of the CWA but have never gotten around to buying any of their cook books. This will be the start of my collection. The recipes are very straightforward and to the point. They feature readily available ingredients and bets of all, the measurements are in pinches, cups and teaspoons rather than grams and ounces. My kind of baking. I am itching to try the Weet-bix fudge and the Ginger Nut bites. I love a recipe that features my favourite foods remixed. I owe you one, AFW. Thanks again. On a less wholesome note, I think I was an Essex girl in a past life. I just can't help myself. I've watched every episode so far on Foxtel. The fake tan that makes the white balance on my television orange, those triple layered eyelash implants, the punchy banter. Oh, and Nanna Pat. I think Nanna Pat must be a member of the Essex Expatriate branch of the CWA. She makes a mean sausage plait, irons a very crisp shirt indeed and is decidedly no nonsense in affairs of the heart. All that talk of fake tan. You must remind me to talk about Invisible Zinc next time. Things are going well with the numerous IZ items I got in what looked like a very modest order. Which is to say that Invisible Zinc does not make you look tandoori. No matter how much of a rush you are in first thing in the morning on the way to work. So well that I may well have to sign in as Elle MacPherson rather than Sydney Shop Girl. May I say 'nighty night', in honour of Nanna Pat and all our grandmother bakers out there? SSG, your gardenia flower looks fantastic!! It's a really proud moment when you get the first flower!! Have you ever worn fresh gardenias in your hair? 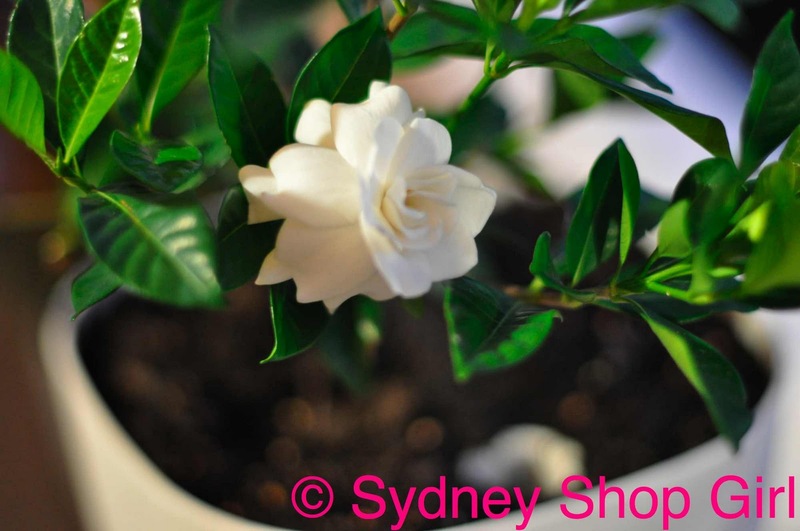 Gardenias are the best flower - they look beautiful and their scent is fab. I love my invisible zinc, but I have to be very careful around my eyes because it stings. Does that happen to you? I love Gardenia plants and have them as a hedge. The smell is gorgeous as it is right by the front door and wafts in during summer. Unfortunately the blooms are now gone and the summer heat has taken a toll. I always look forward to the start of summer when the bloom again. If you feed them with liquid fertilizer they will really take off. It will stop the leaves yellowing too. The CWA cookbook looks great too. I remember visiting a fair in the country and they had a CWA stand. The scones and biscuits were out of this world. Those woman can seriously bake! I'm obsessed with this is Essex, I love their accents and bright colours and fake hair, it's fab! OH MY GOD I AM ADDICTED TO THE ONLY WAY IS ESSEX!!!! I've got the IQ set to record it. LOVE it!! Aren't Gardenia's heavenly? They were my mum's favourite flower. If I could turn back time I would fill her funeral with them. But I was 18 and not thinking straight at the time, they would have been perfection. Can't wait to see your creations from the CWA cookbook!! Love their display at the show every year!! 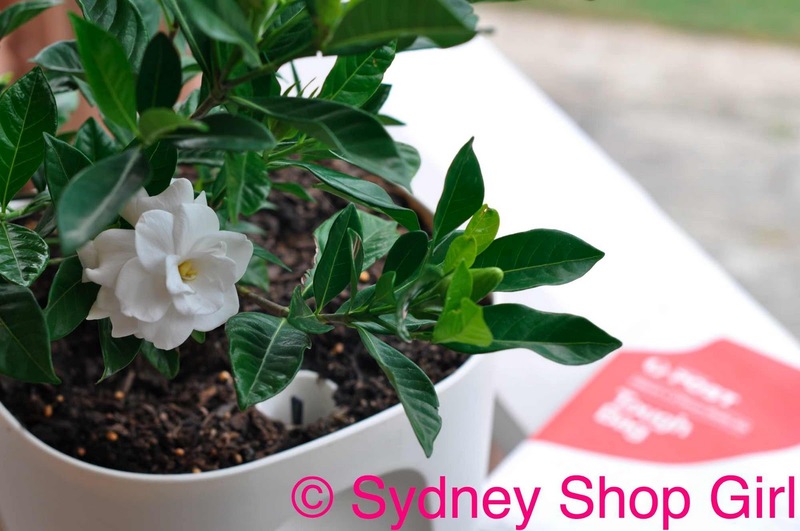 The gardenia must scent the shed with a tropical sweetness...and invisible zinc has me curious! My gardenias survived the heat and are flowering gorgeously - one of my favourite plants. As for Invisible Zinc, I had such high hopes, but unfortunately the colour is totally wrong for my zombie-skin and I look like an Oompah Loompah - I had to give it all to my mother ... sigh. A gardenia hedge is dead easy to do SSG as someone mentioned and when clipped looks fav all the time. Baking daughter loves the CWA cookbook. These country women know how to bake. Being the enabler I am I noticed you wanted a way to tie your twilly. Rush over to the gorgeous Mai Tai's blog and buy one or all of her scarf rings. I have the horns one in both the petite and larger size and they are the bomb. Kate B: you are an official legend in my eyes. I have ordered my Mai Tai scarf rings - plural for the price of a Hermes scarf ring - singular. Tiffany: gardenias are so resilient. A shame that IZ did not work for you. Hostess: I will update the blog when I've given my products a fair trial. Merowyn & Tabitha: I am in fine company then. Real Housewife of Sydney: thanks for the tip. The Distressed Mother: haven't had a problem yet with mine but thanks for the warning. The Stylish Shoe Girl: a hair accessory, that sounds fragrantly gorgeous. Glad you liked my comment of the week! Gardenias are such gorgeous flowers. 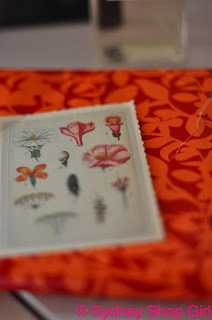 Oh..reading something about flowers makes me so long for spring to come around. Today, we had another Snowmageddon in Oslo - this truly has turned out to be the worst winter for as long as I can remember. But, two more months - and then finally I can start planting flowers on my terrace. One of my absolute favorite things to do. I can't wait.